Hmmmm, doesn’t quite work does it? Well, it doesn’t work either to forget to thank those around us for doing whatever it is they are doing. You see, it is a fundamental underlying human principle for us all to want to contribute and feel valued. In a work setting, this means that doing our job and being remunerated is only part of the equation. We want to do our job, be remunerated and feel valued. Organisation’s today spend a lot of time, money and effort on implementing employee reward and recognition schemes yet fail to develop their workplace leaders in the act of saying thank you. Two simple words; thank and you, and when said with authentic intent are great motivators. A thank you is feedback; feedback that reinforces we are doing something right, and potentially doing it well. A thank you is a behavioural intervention, in that when we are told thank you we are being noticed and when we are being noticed we want more of that so we do more of what we were doing that generated the thank you in the first place. In a personal setting, a thank you sets the behavioural standard also. That is, when our children pick up their clothes and put them in the dirty clothes basket and we say thank you, they are more likely to do it again and again. When our significant other cooks a great meal and we say thank you, we are letting them know how loved and appreciated they are and they are more likely to find ways of doing more for us because they value the contributions to and recognition of the relationship. Think about this, it even works with our pets! When we say good dog, for peeing outside or for not barking inappropriately, what we are saying is thank you. Thank you for peeing in the right place and thank you for not barking at that cat sitting on the fence; a thank you reinforces good behaviour. A genuine appreciation of another through a thank you is a powerful motivator for good behaviour; it is a reward and recognition system that costs nothing. So, how hard is it to say thank you? How hard is it to genuinely appreciate the effort of another? 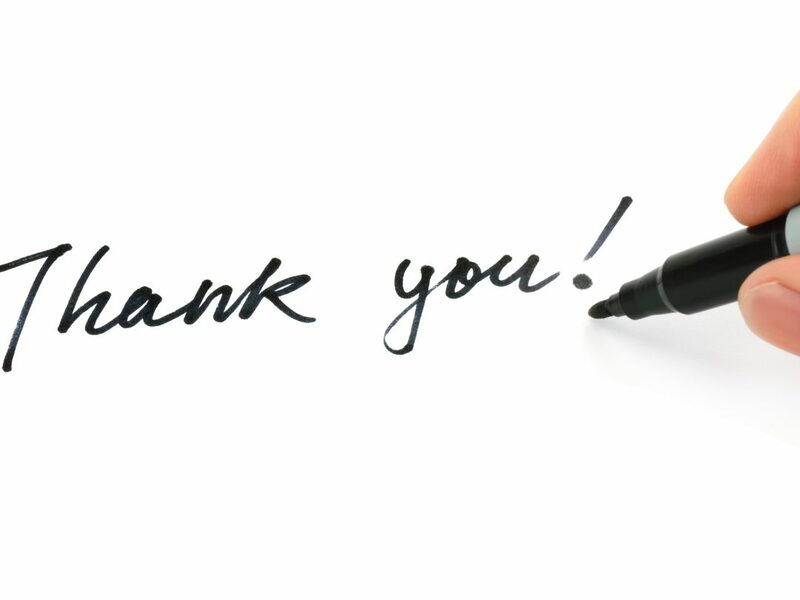 How hard is it to provide feedback to another through these two simple words; thank you? Obviously hard, because it gets overlooked time and time again through excuses such as ‘I shouldn’t have to thank them for doing their job.’ ‘I shouldn’t have to thank him for cleaning his room; this is not a hotel you know.’ ‘She should know I appreciate the work she does.’ And on and on we could go. I am sure you can relate to a lot of these statements? So what is the answer? Just do it. Embed gratitude into your everyday living, let those around you know how much you appreciate them by saying thank you, and when appropriate I love you, often. When was the last time you said thank you? If you have ever wondered how to get those around you to achieve the outcomes you seek, just try these simple words. I have no doubt you will be delighted with the result.